In 2006, at the Museum’s inaugural International Conference on World War II, officials from Norway donated a unique Nazi atomic artifact. Norwegian Counsel General Svein H. Andreassen attended the event representing Norwegian Ambassador Knut Vollebaek to present the rare gift to the Museum on behalf of the People of Norway. That artifact was a metal barrel that contained “heavy water” – an integral component used in atomic fission and proof that Hitler was attempting to develop nuclear weapons. It was produced by the Norsk Hydro company in Norway under Nazi occupation. After multiple bombing attacks by saboteurs and the Allied Air Forces on the facility, the Nazis decided to transport all of the Norwegian heavy water they had produced to Germany so that their scientists could carry on their research in safety. Today, it is known that the Germans abandoned their race for the bomb in February 1944, but the Allies did not have this information at the time. To transport the heavy water from the plant in Norway to Berlin, the barrels had to be loaded onto a ferry and taken across Lake Tinn in Norway. Fortunately, the operation was a failure. On February 20, 1944, British-trained Norwegian resistance fighters planted an explosive device on board the ferry and exploded it as the vessel crossed the middle of the lake, sinking it in the body of water’s deepest reaches and effectively ending the Nazi’s atomic ambitions. The event was the subject of the Kirk Douglas film, Heroes of Telemark. The wreckage of the ferry was located 1,200 feet underwater in 1993 by Telemark natives Johny Skogtad and Thor Olav Sperre (both were in attendance for the presentation). 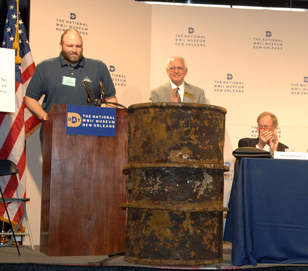 The barrel was recovered from the bottom of the frigid, freshwater lake in 2004 by the Texas underwater archaeology firm, ProMare with the assistance of both Skogstad and Sperre. ProMare’s Brett Phaneuf was also on hand for the memorable presentation. The Nazi heavy water barrel is not on display at this time. It can be seen as part of our Behind the Lines or History & Heritage Tour packages.